Only one day after declaring there was no oil leaking from the well underneath the destroyed Deepwater Horizon oil rig, the Coast Guard announced two leaks were found Saturday April 24. Satellite images showed the slick had spread by 50 percent in a day to cover an area of 600 square miles (1,550 square kilometers), although officials said some 97 percent of the pollution was just a thin veneer on the sea’s surface. An estimated 42,000 gallons of oil per day were leaking from an oil well in the Gulf of Mexico in late April, following an explosion at an offshore drilling rig on April 20, 2010. The rig eventually capsized and sank. This image of the affected area was captured on April 25 by the Moderate Resolution Imaging Spectroradiometer (MODIS) on NASA’s Aqua satellite. The Mississippi Delta is at image center, and the oil slick is a silvery swirl in the lower right quadrant. The oil slick may be particularly obvious because it is occurring in the sunglint area, where the mirror-like reflection of the Sun off the water gives the Gulf of Mexico a washed-out look. The situation has been reported changing. Sunday the Unified Command declared more than 1000 gallons of oil had been spilling into the Gulf. This followed pronouncements on Friday there was no real evidence of significant leakage. Today officials report 42,000 gallons of oil are leaking and must be contained within 12 hours or the problem could take months to resolve. State officials have expressed concerns about the impact on sensitive coastal areas. Containment booms have been erected to contain the spill. April 27 2010: AccuWeather.com meteorologists foresee winds beginning to pull up out of the south Thursday into Friday as the storm system currently plaguing the Pacific Northwest moves across the Nation’s midsection. Oil will be pulled toward the coasts of Louisiana, Alabama, Mississippi and Florida, possibly reaching the beaches early this weekend. Winds beginning late Thursday will gust up to 25 mph, yielding wave heights of 3 to 9 ft, and will continue through early next week. The Gulf is sure to be choppy through this time period. The Associated Press reports that cleanup efforts were first interrupted by poor weather this past weekend. Rain, thunderstorms and rough seas hit the region. 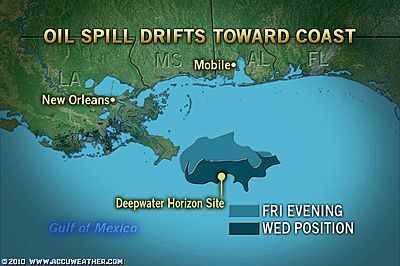 Oil is spilling from the Deepwater Horizon rig, which sunk about 50 miles off the coast of Venice, La. There could be as much as 700,000 gallons of diesel fuel on board the sunken rig. Experts studying the spill estimate that 42,000 gallons of crude oil are leaking each day. A new oil leak was just discovered on Saturday. Fox News reports the oil sheen surrounding the rig is extending 1,800 square miles, which is an area larger than the state of Rhode Island. April 28 2010: Emergency responders began a controlled burn of the Deepwater Horizon oil spill in the Gulf of Mexico Wednesday, as part of a strategy to limit environmental damage to the area’s coastal regions. The burn, originally scheduled for 11 am CST but was delayed until later in the day. 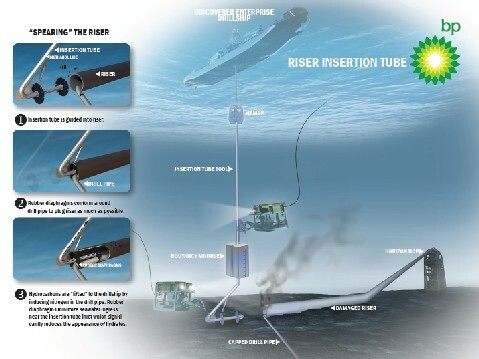 It is designed to reduce the volume of floating oil, as concerns heightened over the impact to shoreline environments and regional industry. The controlled burn requires the oil be of a certain thickness to properly ignite, and involves isolating these thicker patches from the overall spill. “Oil that is at least several millimeters thick is corralled into fire resistant boom, towed away from the spill, and then ignited, leading to a controlled burn of several thousand gallons of oil lasting approximately one hour,” stated a fact sheet on the procedure. Popular Gulf of Mexico holiday resorts in Louisiana and Florida are bracing themselves as the oil from the BP-operated Deepwater Horizon rig reaches shore in the coming days. The threat to wildlife along the coastline – and the devastating repercussions for the local economy – now look likely to be much worse than initially feared. The spill was bigger than imagined – and closer. Five times more oil than BP estimated is gushing into the ocean from the rig which exploded and sank in the Gulf of Mexico last week each day – about 5,000 barrels, or 210,000 gallons. •1,178 personnel were quickly deployed and have been responding to protect the shoreline and wildlife. •76 response vessels have been responding on site, including skimmers, tugs, barges, and recovery vessels to assist in containment and cleanup efforts—in addition to six fixed-wing aircraft, 11 helicopters, 10 remotely operated vehicles, and two mobile offshore drilling units. •174,060 feet of boom (barrier) have been deployed to contain the spill. An additional 243,260 feet is available and 265,460 feet has been ordered. •98,361 gallons of dispersant has been deployed. An additional 75,000 gallons are available and 184,748 have been ordered. •Five staging areas (Biloxi, Miss., Pensacola, Fla. Venice, La., Pascagoula, Miss. and Theodore, Ala.) were set up to protect sensitive shorelines. Some good news swept through here Monday: Winds so far are keeping most of the Gulf oil spill away from shore, and chemicals are doing a decent job dispersing the giant swath of slick crude oil looming off the coast. Last week Google made imagery from NASA’s MODIS available as an overlay for Google Earth, which currently shows the extent of the oil spill through April 29, and Google continue to add more imagery as it becomes available. We’ve also made radar images from ESA’s ENVISAT available through this KML file. 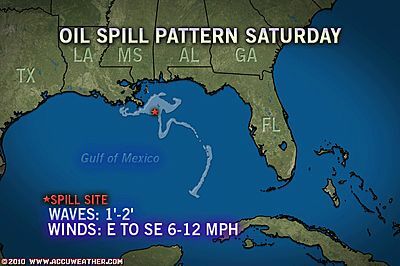 AccuWeather.com reports light winds will translate to diminishing seas for the second half of the week and the weekend as crews move a containment system into place over the oil leak in the northern Gulf of Mexico. However, concerns of hurricanes and drift remain for the weeks and months ahead. The weather will cooperate as a series of domes is moved into place over the leaks via surface vessels. The domes will be sunk into position on the Gulf of Mexico floor. The plan is to then pump the oil from the domes to a barge on the surface. The system is similar to a giant “milk shake.” There already is a chemical dispersal system in place to help break up leaking oil before it reaches the surface. Planes are flying over the slick area delivering dispersal agents to combat the oil at the surface. 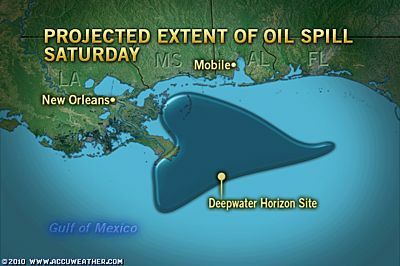 Projected movement of BP oil spill in the Gulf of Mexico. Movement shows spill moving East to threaten Florida’s Panhandle, moving south to potentially get caught up in Loop Current and move onto South Florida/Keys and then up the East Coast to Georgia, SC and NC. In fact, a newly built 100-ton steel-and-concrete box arrived at the site of the oil spill Thursday in the latest attempt to bring the oil leak under control. Workers late Thursday started lowering a giant concrete-and-steel box over the blown-out oil well at the bottom of the sea in a risky and untested bid to capture most of the gushing crude and avert a wider environmental disaster. A worker is carried Thursday from the Joe Griffin to the Q4000 in preparation for lowering the containment box, seen on deck in the background, over the oil leak. The structure could be operating by Sunday. A crane lifted the box from the supply boat that brought it out to sea, and crews from a second boat started the box on its slow journey a mile underwater. It will take hours to reach the seafloor. 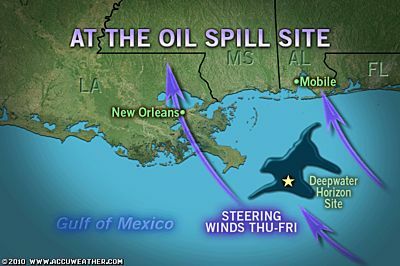 BP Chief Operating Officer Doug Suttles discusses problems in containing the oil slick in the Gulf of Mexico. An DIY instructional video, by Matteroftrust on how to make an oil spill boom, from fur, hair and nylons. By Friday night, crews had lowered the 100-ton concrete and steel contraption onto the blown-out well. Workers were then expected to take 12 hours to let the box settle and ensure its stability before robots could be used to attach a giant funnel. The funnel, it is hoped, will then guide the oil to the surface. De media moeten de olieramp in de Golf van Mexico niet overdrijven. Veel kwetsbaar zeeleven is er in die regio niet en de olie zal snel verdwijnen, stelt Kees Camphuysen. Hij is verbonden aan het NIOZ te Texel en coördinator van het Nederlands Stookolieslechtoffer Onderzoek, dat sinds 1977 alle olieslachtoffers op de Nederlandse kust registreert. Hij geeft zijn mening op de opiniepagina van NRC Handelsblad van gisteravond. Rond de olieramp weet BP de media te handig te bespelen, betoogt Liesbeth van Tongeren. ’De ramp wordt bewust stelselmatig onderschat, schrijft ze. BP wist de toezichthouder te bewegen vrijstellingen te krijgen. En nu er toch een ramp is, weet het concern de media te handig te bespelen, betoogt Liesbeth van Tongeren. Engineers are now examining new ways of combating the problem, one of which involves using garbage to clog the failed blowout preventer, the 450-ton, 48-foot-tall device that sits atop the well at the heart of the spill. That apparatus is designed to stop leaks but hasn’t been working properly since the oil rig explosion on April 20. Dubbed “the junk shot,” the operation would literally attempt to stuff shut the blowout preventer using garbage. Great Solution to Clean Oilspill: BP not interested or no time? Ben de Vos en Thomas Verburg uit Strijen en Rotterdam hebben iets bedacht dat in hun ogen revolutionair is. Ze hebben geprobeerd hun uitvinding onder de aandacht van BP te brengen maar tot nu toe krijgen ze geen respons. This video, released by the office of Senator Bill Nelson of Florida, shows oil flowing from the kink in the well “riser” — the collapsed pipe leading up from the well head on the sea floor. New Orleans’ WWL reports that grass will die in affected wetlands within 5-7 days. Plaquemines Parish President Billy Nungesser scolds Army Corps of Engineers for not approving Louisiana’s emergency request to build barrier islands that would protect wetlands from oil. President Barack Obama announces that the independent commission he created for the BP Deepwater Horizon Oil Spill and Offshore Drilling will be chaired by former Florida Governor and Senator Bob Graham and former EPA Administrator Bill Reilly. He promises accountability not just for BP, but for those in government who bore responsibility. Wouldn’t dispersants added to the oil spill make separating oil from water MORE and not LESS difficult? If you answered yes, you’d be in the same camp as top environmentalists and scientists. They assert that the addition of dispersants to the gulf oil plumes assisted in an “out of sight, out of mind” strategy by which BP could mitigate public fallout. It’s one of America’s biggest environmental disasters and the largest oil slick in the Gulf of Mexico since 1979. Now, as experts scramble to stop the oil leak, NGC will reveal what happened to the Deepwater Horizon as a blowout tore it apart, killing 11 of the 126 men on board, sending oil toward the coastlines of Louisiana, Mississippi, Alabama and Florida. The special will contain never-before-seen video shot by salvage crews as they battled to get close to the burning rig. Thursday, May 27 at 9 pm on the National Geographic Channel. Animated footage of the “top kill” procedure which BP will perform this week at the Deepwater Horizon site in an effort to stop the leak. The next option is to place a custom-built cap known as the “lower marine riser package” over the leak, the company’s chief operating officer, Doug Suttles said. BP crews were working Saturday to ready the materials for that option should it become necessary, he said. 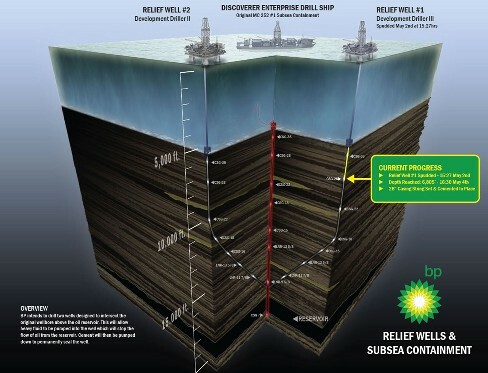 And if “lower marine riser package” were to fail, he said, BP engineers would try placing a second blowout preventer on top of the first, which failed to cut of the oil flow after the April 20 explosion of the Deepwater Horizon rig. The failed blowout preventer is a 48-foot-tall, 450-ton apparatus that sits atop the well 5,000 feet underwater. Meanwhile, teams in Louisiana were working Saturday on a clean-up project aimed at protecting coastal marshes while BP continues its efforts to stop oil from gushing into the Gulf of Mexico. Met diverse instantie reeds met Email geprobeerd een te geven dat ik, naar eigen mening, voor 100% heel snel het lek kan dichten met een mechanische stop. Er zijn reeds naar diverse instantiets tekeningen verstuurd. Helaas zit hier geen mogelijkheid bij foto’s van het prototype als bijlage teo te voegen. Is dit als nog mogelijk een Emailadres te krijgen om dit te verzenden? As work continues to install the LMRP cap, this video animation illustrates how it will be connected to the drillship riser, prepped, maneuvered into position and installed on top of the BOP stack. Ideeënbus BP Olieramp Golf van Mexico: Heeft u een Idee of een Oplossing? Nederland Innovatieland denkt actief mee over oplossingen voor de olieramp in de Golf van Mexico. Het consulaat-generaal in Miami heeft al diverse mensen gesproken met ideeën hoe het lek gestopt en de olievervuiling beheerst kan worden. BP tapt momenteel 20 procent van de lekkende olie af, maar de lekkage lijkt voorlopig nog niet definitief opgelost te zijn. Mocht u een idee of oplossing hebben, dan kunt u rechtstreeks contact opnemen met het Joint Incident Command Center. De Joint Incident Command geeft de volgende details (in het Engels): “Throughout the ongoing response efforts thousands of people across the globe have offered their ideas for stopping the flow of oil into the Gulf, containing or recovering it, or cleaning it up. BP has established a process to receive and review submitted suggestions, on how to stop the flow of oil or contain the spill emanating from the Mississippi Canyon 252 well. Proposals are reviewed for their technical feasibility and proof of application. More than 4,800 ideas have been proposed to date. Given this quantity of technical proposals suggested by industry professionals and the public, it may take some time to technically review each one. All proposals submitted through the process defined below will be reviewed. Failure to follow the process below will likely delay proposed solutions from being reviewed. If you want to offer suggestions by phone:Please call +1 281 366 5511. After each call, the caller will be sent a simple form to provide details. When the caller completes and submits this form, the proposal is sent to BP technical personnel for review. 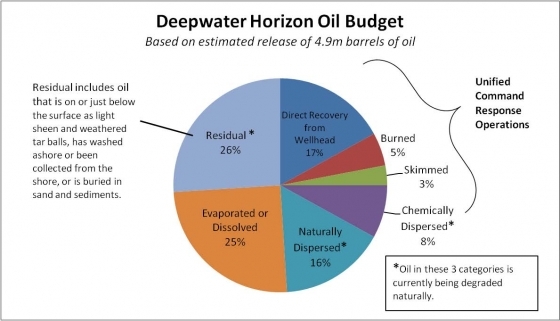 A suggestion submission form is available at: http://www.deepwaterhorizonresponse.com/clients/2931/319487.pdf. Follow instructions on the form. President Obama speaks after meeting with BP executives and announces that the company has agreed to set up a $20 billion escrow account administered by an independent party to pay claims for damages from the oil spill. June 16, 2010. BP has caused an unprecedented environmental and economic disaster in the Gulf of Mexico and along with conservative politicians, a well oiled public relations machine and their countless and shameless lobbyists they continue to push for more irresponsible drilling and want to make us believe that what they are doing is righteous and necessary. Enough. We don’t need more shameless media games and manipulative political agendas. BP Oilspill: Relief well drill is only days away from leaking oil pipe. Up to 800 more nests across Alabama and Florida beaches will be dug up in the coming months in an attempt to move some 70,000 eggs to safety. Shamarr Allen, Dee-1, Paul Sanchez, and Bennie Pete get together to express their feelings about the Gulf Oil Spill. Oceanographer and documentary filmmaker Jean-Michel Cousteau recently checked in with the Rundown to update us on his team’s explorations since returning to the Gulf Coast. Since his last visit, Cousteau has been both on the water with local fishermen and in the air surveying the site of the BP oil spill via helicopter. The team is concerned with the growing impact the oil is having on animals throughout the Gulf’s ecosystem as the damage from the oil makes its way up the food chain. Follow 3 Sea Turtle Oversight Protection volunteers for a night in Ft. Lauderdale Florida as they rescue a 100% disoriented nest #FT 35, a green sea turtle that was stuck under beach chairs and rescued many more turtles from 2 other nests #FT 13 and #FT 33. All of which would have died without assistance. It took 2 FWC officers and 3 volunteers to save the green sea turtle. This is video proof of a serious problem. Sea Turtle hatchlings become disoriented by lights on the beach from businesses and homes. The hatchlings walk towards the light, onto roads, fall into drains or become dehydrated and use their small energy reserves wondering the beach in circles. The instinct to go towards the light is so powerful that these hatchlings had to be manually redirected several times, even after they were put next to the water. How is this legal to kill a Federally protected endangered species??? ITS NOT!!! IT IS A FELONY OFFENSE!!! Ft. Lauderdale has very detailed and specific lighting ordinances to be compliant with the Federal Endangered Species Act. Interesting move of President Barack Obama. For the first time he use the word we instead of talking about BP (the bad guys). Now there’s some success it’s we BP and The Government, The White House (the good guys). I have made a webpage with a map that contains the GPS positions of all ships and oil riggs in the Gulf of Mexico near the former rig Deepwater Horizon. This information is currently very useful as it is reported that the vessels near the BP oil spill will be moving to calmer waters now that the tropical storm Bonnie is approaching, and returning when the storm has passed. It will be exciting to monitor the moves of each vessel! 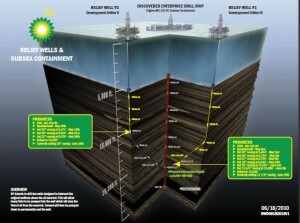 Or google for “bp olieramp gps kaart”. Except, it’s not. According to written responses released to congressional investigators on Friday, the mud contains ethylene glycol, a highly toxic chemical commonly used in anti-freeze, and caustic soda, a compound more commonly known as lye that is is also toxic. This, of course, also raises the question of how much of this stuff is pumped into the ocean on a regular basis. 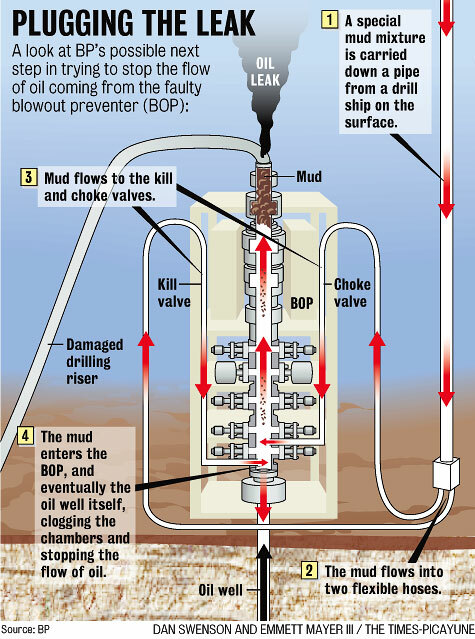 Drilling companies use about 100,000 gallons of this sludge for each operation. It’s a question that Reps. Ed Markey (D-Mass.) and Lois Capps (D-Calif.) raised in a statement over the weekend, following BP’s disclosure of the ingredients of the mud. Sodium hydroxide (NaOH), also known as lye and caustic soda: Solid sodium hydroxide or solutions of sodium hydroxide will cause chemical burns, permanent injury or scarring if it contacts unprotected human or animal tissue. It will cause blindness if it contacts with the eye. Protective equipment such as rubber gloves, safety clothing and eye protection should always be used when handling the material or its solutions. Dissolution of sodium hydroxide is highly exothermic, and the resulting heat may cause heat burns or ignite flammables. It also produces heat when reacted with acids. It is corrosive to glass and some metals. Keep away from aluminum. Engineers in the Gulf of Mexico have abandoned efforts to fish out pieces of drill pipe stuck in the damaged Macondo well and early next week will begin trying to remove the blowout preventer — a crucial step in finally sealing the well. Tip: De BlowOutPreventer van 300 ton zwaar en 15 meter hoog wordt op 3 of 4 september 2010 losgemaakt van de falende boorput en vanuit een diepte van 1500 meter met een giga-kraan aan boord van het mobiele olieplatform Q4000 getakeld. Er zijn unieke webcams toegevoegd op de webcam mozaiek pagina. Deze webcams tonen live beelden aan boord van het Q4000 olieplatform en tevens een live monitor van de torsiekrachten op de kraan! Het Britse olieconcern BP houdt zich zeer slecht aan de veiligheidsvoorschriften voor olieplatformen. Op vier van de vijf vorig jaar geïnspecteerde boorplatformen in de Noordzee worden voorschriften genegeerd. Dat schrijven Britse kranten woensdag op basis van inspectierapporten van toezichthouder Department of Energy and Climate Change (DECC). BP zet de olieboring in de Noordzee toch door ondanks veel kritiek en negatieve rapporten die stellen dat de oliemaatschappij zich niet aan de veiligheidsvoorschriften houdt op haar olieplatformen. De angst zit er goed in, want ten westen van de Shetlands recht boven Schotland, gaan de boren 1,500 meter de zeebodem in. Dat is net zo diep als bij de boring in de Golf van Mexico die catastrofaal afliep. Tony Hayward, directeur van BP ontkent dat er een ‘systematisch veiligheidsprobleem’ is bij zijn bedrijf. Woensdag praatte hij met DECC en de Britse overheid over de diepzee boring in de Noordzee. Hij zei dat de risico’s bij het boren in de Noordzee geheel anders zijn dan in de Golf van Mexico. gasoline, naphtha, distillates and residual fuel oils in 23 tanks. On September the 9th one of the storage tanks caught fire swiftly followed by another holding one million liters of NAPTHA. No one can be sure of the full extent of the environmental consequences yet but the initial indication is grim. Fingers through sand surface showing pollution. Surface pollution is apparent both on the beaches and in the waters of the shore line. Pollution onto gotolake got the full content of the first heavy rain clouds the implications of this pollution going in to the islands food chain and its water treatment system that provides the island with desalinated water could also be far reaching and prove a long and hard clean up needed. Anderhalf jaar voor de explosie op het boorplatform Deepwater Horizon in de Golf van Mexico de grootste milieuramp uit de Amerikaanse geschiedenis veroorzaakte, gebeurde in Azerbeidzjan een gelijkaardige ramp in een gas- en olieveld in de Kaspische Zee. BP hield dat geheim, maar het verhaal is nu uitgelekt dankzij WikiLeaks. Net zoals bij de Deepwater Horizon was het de blowout preventer, een soort veiligheidsklep, die het begaf, en net zoals in de Golf van Mexico lijkt het niet naleven en installeren van verplichte veiligheidsvoorzieningen aan de oorzaak te hebben gelegen. Hoeveel gas ontsnapte is onduidelijk, maar het zou gaan om een enorme hoeveelheid. Door het lek moesten twee gas- en olievelden maandenlang dicht, met een verlies van 500.000 vaten per dag als gevolg. The Obama administration said Monday it will allow 13 companies to resume deepwater drilling without any additional environmental scrutiny, just months after saying it would require strict reviews for new drilling in the wake of the BP oil spill. The government said it was not breaking its promise to require environmental reviews because the 13 companies – which include Chevron USA Inc. and Shell Offshore Inc. – had already started drilling the wells without detailed environmental studies. You’d think that if your company was responsible for the worst oil spill in the history of the United States, bonuses for the year would be out the window. But that’s not the mindset of BP, the company at the center of the Deepwater Horizon disaster. According to its annual report, the company awarded two senior executives bonuses of more than $160,000. The sad fact is that this was an entirely preventable disaster. Poor decisions by management were the real cause. The explosion aboard the Deepwater Horizon rig that caused one of the worst oil spills in history is set for a Hollywood adaptation. A drama showing the courage of workers on board the Deepwater Horizon rig in the moments leading up to April’s disastrous oil spill in the Gulf of Mexico looks set for the big screen. A total of 713 oil platform workers were evacuated Tuesday when the Flotel Jupiter oil platform began to collapse into the Gulf of Mexico, said state-owned oil company Petroleos Mexicanos (Pemex). The Flotel Jupiter oil platform which housed the 713 workers is about 80 kilometers (50 miles) off the coast of Campeche state in the Gulf of Mexico. Initially 638 workers were evacuated earlier Tuesday after water entered part of the facility and it began to lean to one side, but Pemex said by the afternoon all 713 workers on board the platform had been evacuated. After several attempts to rescue the facility, the platform late Tuesday “turned over and sank,” said Pemex. Pemex reports that 2075 barrels of diesel fuel were stored in the pontoons, and 82 barrels of fuel were stored in on deck. The first Anniversary of the Deepwater Horizon will be a deeply painful day for many of the workers who were on the fateful rig, and the families of the deceased. We must remember that eleven people died that day. At least 40 workers were also injured, and a number have not worked since, with others refusing to go back to sea. Olieconcern BP heeft in 2011 een winst geboekt van ruim 18 miljard euro. Over 2010 maakte BP nog een verlies van bijna 4 miljard euro, als gevolg van de ramp met het boorplatform in de Golf van Mexico.